Whether it’s a coffee stain to the upholstery, a door ding from the shopping centre, or a scuffed alloy wheel from parallel parking gone wrong, little accidents can quickly spoil the finish of your Audi and reduce its resale value. Audi After Care Appearance Protection is designed to protect your Audi vehicle from common mishaps that can quickly deteriorate its original showroom finish. Appearance Protection is available for new, Certified Pre-Owned and used Audi vehicles. 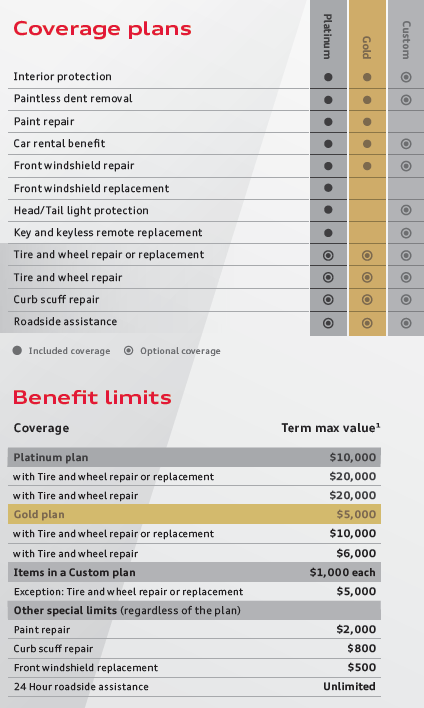 The program has customizable plans to suit your coverage needs and the length of time you intend on owning your Audi. With Appearance Protection on board, you will have peace of mind knowing that your vehicle will always look its best while maximizing its resale value. Pricing varies by Audi model, length of plan, and level of coverage. Please contact our Finance Manager, Andrea Douglas or Susan Bauman for further details.